How does one quantify the importance of innovation in the world of filmmaking? To some it might mean very little, as a traditionally told story and endless amounts of regurgitated tropes play mighty fine for them, but for me true innovation is something I can hardly describe my admiration for with words. Hell, I even admire an attempt to be bold and daring that ultimately fails because at the very least something fresh and exciting was attempted rather than a director playing it safe. Waltz with Bashir is innovative. 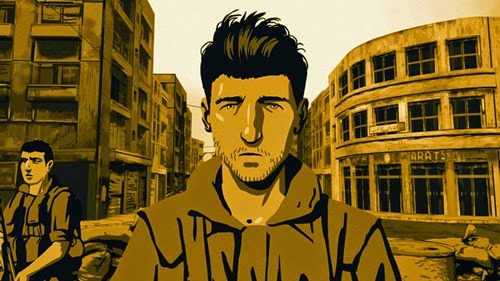 Waltz with Bashir is bold, fascinating, heartbreaking, surreal yet all too real at the same time. Waltz with Bashir truly is unlike anything I have ever seen, and that is a wonderful thing. I have gained a reputation at work for being the "movie guy" so I will often times get asked "Hey Scott, what did you watch last night?" as a way of sparking up some small talk. "Waltz with Bashir. It's an animated documentary from Israel." I answered today. You can imagine the puzzled looks I saw as a reaction, and I can't blame them. An animated documentary? How does that work? It works. It works so damn well. Ari Folman served in the Isreali Army during the 1980's and fought in the Lebanon War, yet he has trouble remembering a single thing that occurred during that time in his life. He decides to get together with friends and survivors of the war to try to piece together moments that he has somehow forgotten, or perhaps pushed out of his mind intentionally to avoid the pain of memories. Initially it seemed like a strange decision to take such haunting imagery and animate it, and one of the most raw and powerful aspects of documentary filmmaking is the ability to see real people talk about real events or real feelings. To remove that factor might seem like a misstep, but somehow the power and the pain is still there, simmering behind their eyes as they recall the horrifying nature of war. If anything the striking visual style of the animation captivated me in a way that felt totally unique and the result was a soul stirring piece of cinema. The last few moments of Waltz with Bashir will linger with me for quite some time thanks to an artistic decision that reminds us just how real everything that occurs during the film is, even if we try to trick ourselves into believing otherwise. So how do you quantify the importance of innovation? You don't. All that matters is if what is presented means something to you, if it stirs up that profound feeling when you experience something that stays with you for some time to come. 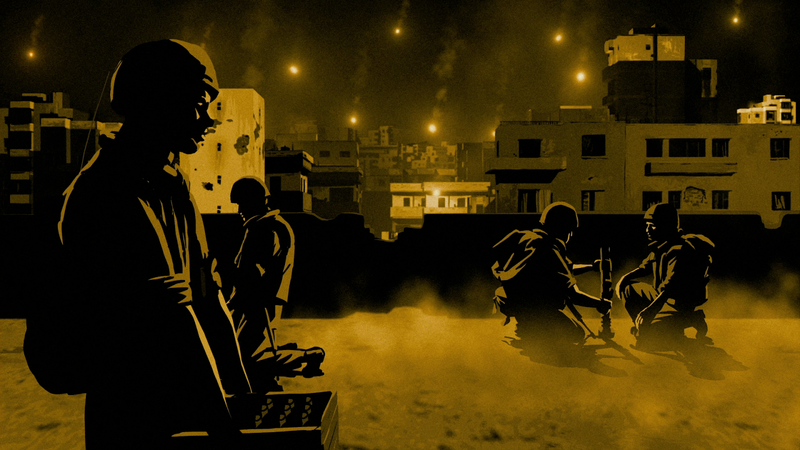 When innovation and execution come together as brilliantly as they do in Waltz with Bashir, it's extraordinary.